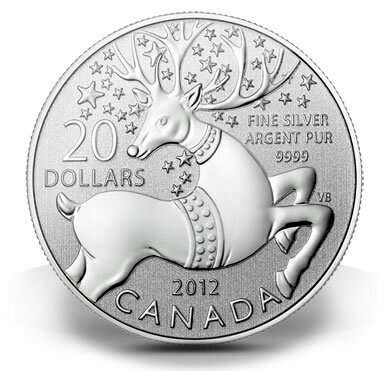 The Royal Canadian Mint has a holiday themed fine silver coin available that many would consider an outstanding gift. Released for ordering back in September, the $20 for $20 Magical Reindeer Silver Coin may still be purchased directly from the Mint, while the extremely limited mintage lasts. As indicated by the name, the coin depicts the image of a reindeer on the reverse. It is being sold for $20 which is the exact same amount as the face value of the strike. All five of the previous releases sold out. Their mintage caps ranged from 200,000 for the first strike up to 250,000 of the following releases. The mintage of 250,000 remains in place for this release with the Mint indicating only a few remain available. The reverse design of the reindeer was completed by Virginia Boulay. It depicts a reindeer with its front hooves in the air and its head and antlers surrounded by a field of stars. Reverse inscriptions include , "20 DOLLARS," "FINE SILVER ARGENT PUR 9999," "2012" and "CANADA." Shown on the obverse of the coin is the Susanna Blunt’s effigy of Queen Elizabeth II. Encircling the profile portrait are the inscriptions, "ELIZABETH II" and "D·G·REGINA." Each of these coins is composed of 99.99% fine silver. Its total weight is 7.96 grams approximately equal to a quarter ounce of pure silver. Its diameter is 27mm and it comes with a serrated edge. The Mint indicates a household order limit is in place. It is available for ordering only to addresses in Canada and the United States with a maximum of three coins shipped per address.